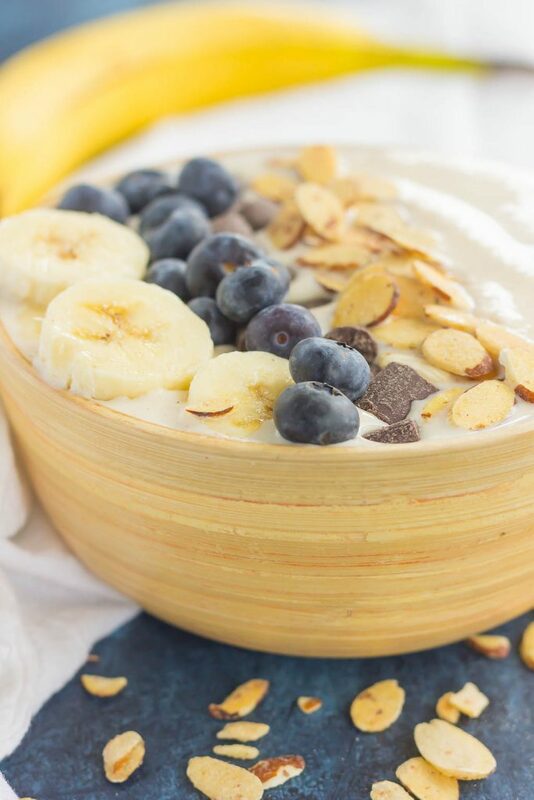 Filled with bananas, almond butter, and good-for-you ingredients, this Banana Nut Smoothie Bowl is a delicious way to start your day. Add your favorite toppings and your healthy, protein-filled bowl makes a deliciously simple breakfast or snack! As in, I’ve been eating a banana almost every day of the week! And that’s surprising for me, since I’ve never gotten into that habit before. But, it’s not to say that I don’t love bananas, because I do! I really do…from this Baked Banana Bread Oatmeal, to that Banana Caramel French Toast Bake, this Banana Bread Granola, these Banana Chocolate Chip Muffins, Banana Bread Scones, Banana Kiwi Green Smoothie Bowl, Strawberry Banana Muffins, and Peanut Butter Banana Energy Bites, I love banana flavored anything! Lately, I’ve been slicing a banana and eating it with a dollop (or three) of peanut butter and a drizzle of honey. It serves as the perfect breakfast or snack! And my latest obsession? 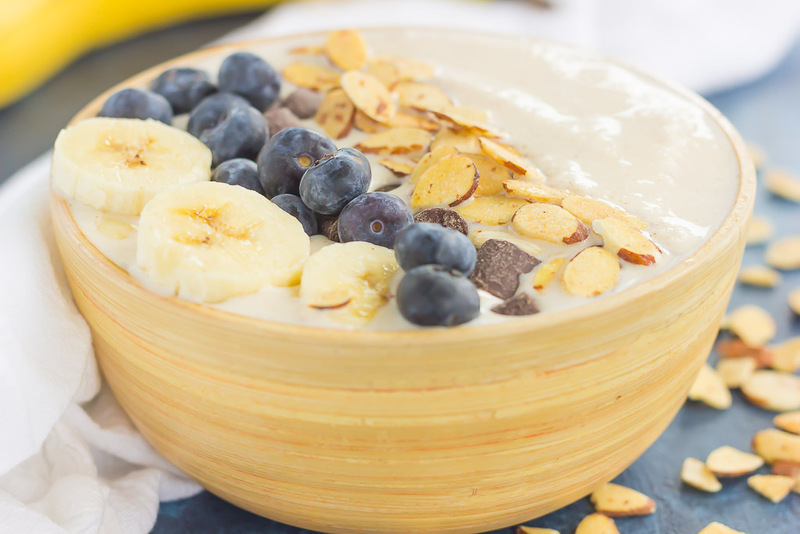 This Banana Nut Smoothie Bowl! And you know me, I’m all about the easy recipes around here. Especially when it comes to breakfast. And eating a smoothie in a bowl is just a little more fun than drinking it out of a glass. Because, let’s face it, it’s all about those toppings! 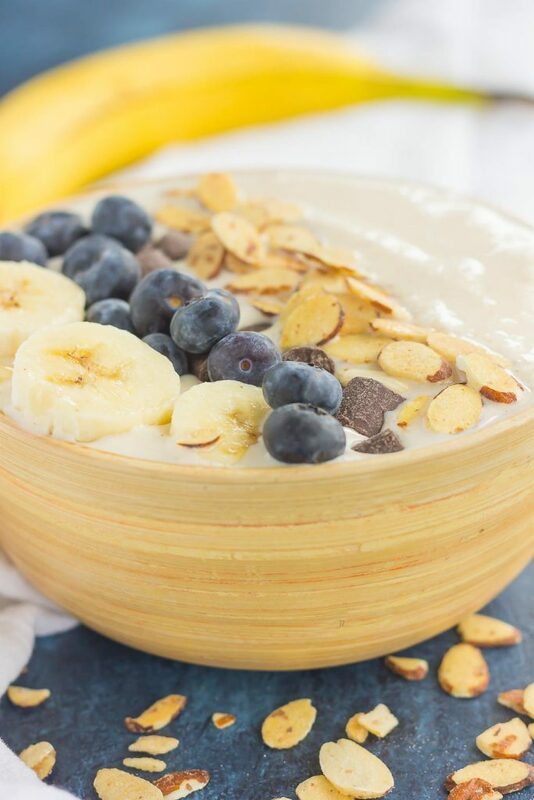 Ok, so I also love the texture of this Banana Nut Smoothie Bowl. It’s extra thick, extra creamy, and loaded with flavor. And it couldn’t get any easier to make! Simply pile everything in a blender (I used my new vitamix) and blend away. Add your favorite toppings and get ready to be wowed. 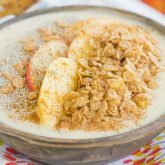 So if your breakfast or smoothie routine needs a little jazzing up, this Banana Nut Smoothie Bowl will do just the trick! In the canister of a blender, combine the bananas, yogurt, milk, vanilla extract, almond butter, honey, and ice. Pour into a medium-sized bowl and sprinkle with toppings. Bananas make the best snack! Thanks, Dawn! This is SUCH a beautiful and Monday-worthy smoothie bowl, Gayle! I'm dying over all the gorgeousness you loaded on top! I want to dig a spoon right into my screen! Thanks for the smoothie love, Sarah! I eat a banana everyday without fail and have for many years! I love them and I will love this! It's time I give the banana the attention it deserves! Those toppings are calling my name! Plus, it's just so pretty! Pinned! Aren't bananas the best? I'm loving them any which way I can get my hands on them! Thanks, Annie! Oh gosh, I LOVE naners and I go through phases where I will eat one every day for months, then I take a break, and then I'm right back at it again. My husband is the same way too! Obviously I'm loving this smoothie bowl!!! Yesssss to making it super thick and creamy! And I loooove that you used almond butter, Gayle! Plus toppings are my life, so you KNOW I'll be loading this delicious bowl up with ALL the toppings! Pinned! Cheers, friend! Yay for bananas all the time! :) Thanks for the smoothie love and pin, friend! This is a perfect breakfast ???? It sure is! :) Thanks, Pamela! I'd love to start off my week with one of these smoothie bowls! I just picked up some bananas. I need to get a couple in the freezer, so I can make this! Smoothie bowls are the best! Thanks, Jessica! Such a beautiful smoothie bowl Gayle! I've been eating a lot of bananas lately, too! Pinning to try it for breakfast. 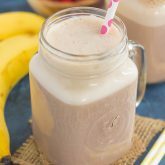 I eat bananas every day and love them in my smoothies! 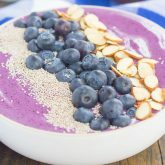 I love everything about this smoothie bowl, especially that you added almond butter for more protein and flavor. This looks like a breakfast everyone in my house would love! Thanks, Marcie! I'm hooked on using almond butter in smoothies! Totally on board with this one! Almond butter stands way up there on my list of favorite healthy snacks! I should definitely try eating it in other ways, haha. So far it has been a straight out of the jar affair. For like 7 years... I should try this recipe! Almond butter is delicious on its own. Thanks, Milena! Aren't bananas the best? I'm seriously hooked on them, especially in smoothie form. Thanks for the sweet comment, Demeter! Smoothie Bowls are my love language! I eat one just about every day, and this particular combo is calling my name. Such a great way to start the day! Aren't they the best? Thanks, Blair! This is a smoothie bowl I could totally go for! Love the banana nut flavors and the extra crunch on top! 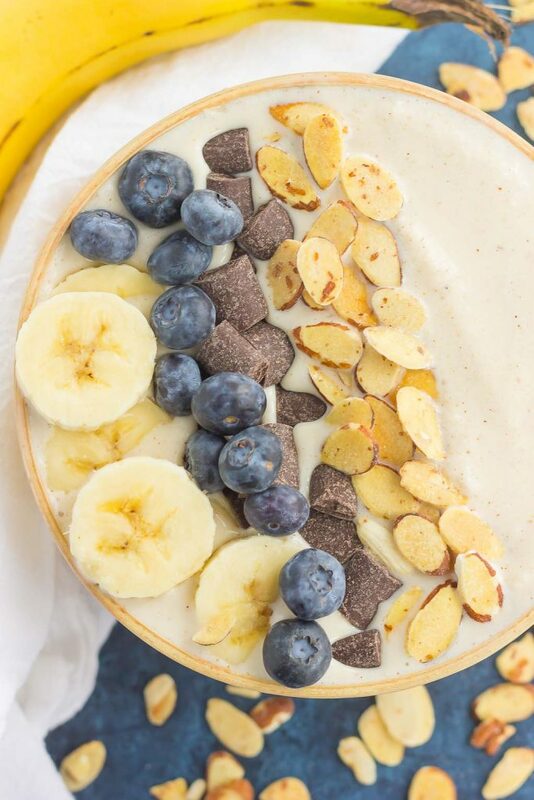 Love all the yummy goodies you packed into this pretty smoothie bowl. I could seriously have one everyday and the banana nut combo sounds perfect!! I'm addicted to smoothie bowls! :) Thanks, Kelly! Yummm! I love bananas, too, but don't really eat them too often. But sometimes I do throw half of one into my standard kale smoothie and it adds soooo much deliciousness. 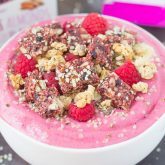 Love the idea of this smoothie bowl!! Thanks, Sues! Banana smoothie bowls are my new favorite! I eat a banana everyday too! I think I need to try this smoothie bowl next because it looks so good! Thanks for the smoothie love, Manali! Thanks for the kind words and for stopping by, Cara! My kids don't likem yogurt. Today I followed up banana nut smoothie and they just love the fruity and nutty taste. I'm so glad to hear that, Amber! Sounds like this is perfect for your kids. Thanks for stopping by and letting me know how it turned out! Hi Alexia! I don't provide calories, as I don't want to give the wrong information. However there are plenty of calorie counters that you can find online to help with that.